With some experience fixing up her prior California residences along with inspiration from her clients' home improvement projects, Moore undertook the role of general contractor, organizing and orchestrating the efforts of 10 different contractors to update and modernize the 2002 built home from floor to ceiling. 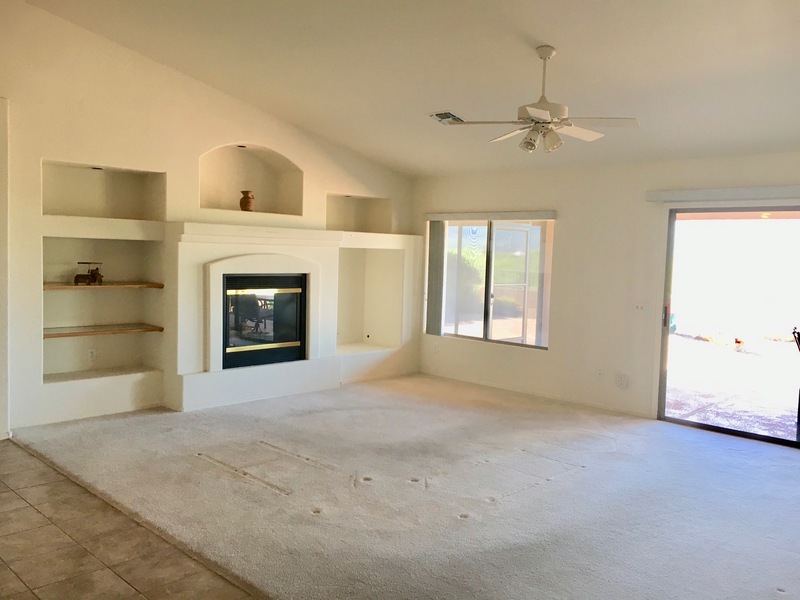 The house was repainted inside and out and existing carpet and vinyl flooring made way for an expanse of wood-look ceramic tile flooring and 5' baseboards. To further capitalize on views, a new picture window was added to the great room along with two new windows that flank the master bedroom slider. Additionally, the house was refitted with new window coverings, lighting fixtures and ceiling fans inside and out. The upgrades create a light, airy ambiance and lend a clean feel and seamless flow to the home's open plan. Keeping the original boxes intact, kitchen cabinets were refaced and doors replaced with knotty Alder modern shaker-style cabinet doors finished with a simple crown molding and accented with striking nickel pulls. The wavy design of the pulls, along with the undulating pattern of sleek new 'Kashmir Cream' granite tops, provide a complimentary offset to the linear modern aesthetic of Moore's striking new kitchen. Providing more storage and counter space, an additional bank of cabinets extends beyond the stove and an extra cabinet broadened the existing kitchen island, providing a more practical work space. Deciding to 'lower the bar,' Moore opted to replace the traditional higher level breakfast bar with a single level counter height bar. Along with an uninterrupted expanse of gorgeous granite, she gained a greater flow between the kitchen and great room space, more conducive for entertaining. The same refinished cabinetry and granite upgraded both bathrooms, where counters were raised to executive height and outfitted with new nickel hardware and fixtures. Both the master walk-in shower and guest bath/ shower were remodeled with a handsome floor to ceiling tile with mosaic accenting. In both baths, oval mirrors above each sink vanity replaced the dated wall-to-wall mirrors. Originally designed for older bulkier electronics, the built-in media wall was streamlined and modernized, with its new narrower depth adding more living space. Arched display niches and built-in shelves were replaced by a simple arrangement of two lighted rectangular niches to display artwork which flank a flat screen television mounted above a contemporary linear gas fireplace. A focal point anchor of the room, the new arrangement has a balanced Zen-like feel. 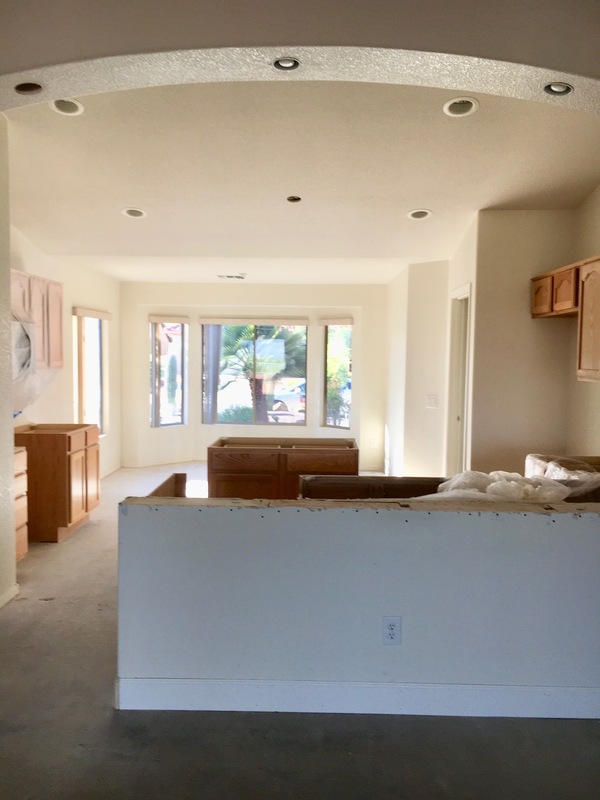 Other improvements include an Organizer's Dream built-out master closet, new water heater, new water softener system, upgraded kitchen windows, new slate appliances, under cabinet lighting, and surround sound. To complete the home's contemporary identity, Moore took a minimalist approach to furniture and accessories, choosing a soothing neutral palette with some bold pops of red. The result is a modern sleek sophistication that feels inviting and soothing.